Hope everyone has enjoyed a wonderful festive season, well, still enjoying. Weather is glorious, warm and sunny, a perfect time to have a break from work and travel. Mr MWCED and i had a quiet Christmas Day, cooked some stuffed turkey and ham, a long lunch over most of the afternoon, and gloried in just being the two of us. Boxing Day we shared with my son and his girlfriend, who had just spent Christmas with her family. We decided to have another ‘Christmas’ feast, though this time it was dinner. Their favourite foods are steak and salmon, so it wasn’t difficult to figure out a menu. A piece of fillet cooked to perfection by Mr MWCED was devoured, and the Salmon was mighty delicious. The idea for the dish came from a December 2010 Taste magazine (NZ), as did a couple of our recipes this year, so it was definitely worth keeping. 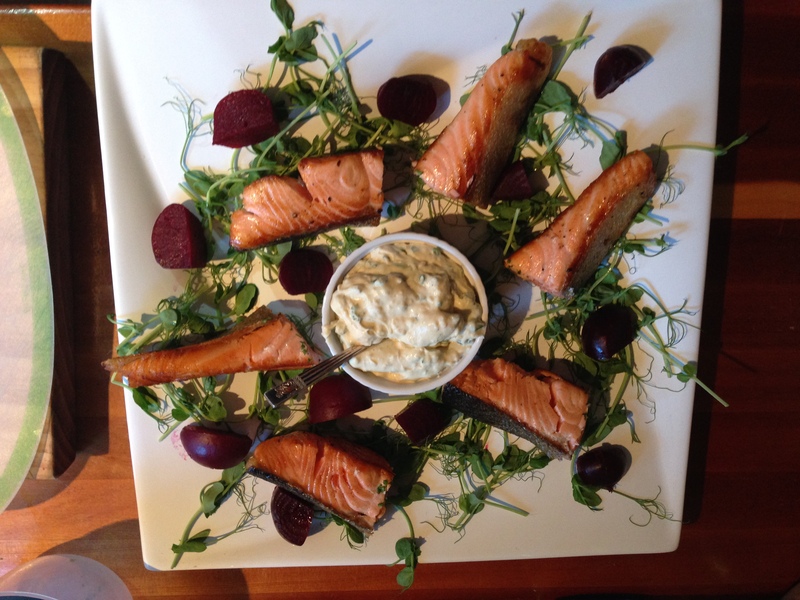 The mix of salmon, fresh beetroot and a light horseradish sauce was wonderful. Will have to do again, though need to choose the moment as Mr MWCED isn’t a salmon fan. 300g salmon – the original recipe uses hot smoked salmon; I used fresh salmon and cooked it just before serving, letting it cool to room temperature; up to you…. Mix horseradish with the lemon juice, vinegar, chives, dill and a pinch of salt and pepper, then fold into the mascarpone to combine. Chill. Taste also did a couple of other steps that I missed out, as the ingredients were so fresh and tasty I didn’t think it needed anything else. You can make a red pepper sauce (with a little chilli) and also you can lightly cook the beets in olive oil. You can also scatter spring onions and snow pea shoots. As our salmon was still warm I served the horseradish mascarpone in a bowl, but you could dollop it in the centre of the plate if your salmon is colder.